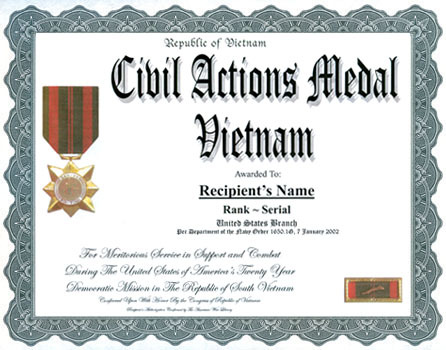 The Republic of Vietnam Civil Action Medal is authorized as an individual foreign award to some members of the United States Army and certain units. 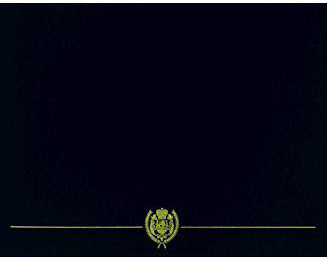 It is authorized to all USMC and USCG personnel, and to all USN personnel who served in-country (on land). (Ref: SECNAVINST 1650.1G N09B13; 7 January 2002) who served in-country Vietnam. 1. Description: Medal: A bronze eight pointed star with alternating points of the star lined, superimposed by a disk with a figure of a soldier, a child and a farmer with a shovel, all enclosed by a white enamel designation band inscribed DAN-VU at the top and BOI-TINH at the bottom. Ribbon: The ribbon is 1 3/8 inches in width and consists of the following stripes: 3/32 inch Bottle Green; 3/16 inch Scarlet; 23/64 inch Bottle Green; 1/64 inch Scarlet; 1/16 inch Bottle Green; 1/64 inch Scarlet; 23/64 inch Bottle Green; 3/16 inch Scarlet; and 3/32 inch Bottle Green. The ribbon is worn with a palm to indicate level of awarding authority. The ribbon is enclosed behind a gold color metal frame. b. Organizations which have been awarded the Republic of Vietnam Civil Actions unit award may display a streamer on the organizational flag. The streamer is the same pattern as the ribbon with the palm near the heading of the streamer. The inscription will be as indicated on the unit's lineage and honors. c. The Republic of Vietnam Civil Action Medal was awarded as an individual foreign decoration in certain instances. When worn as an individual foreign decoration, it is worn without the gold frame. d. Recipients of the Vietnam Honor Medal are authorized the VCAR.